This town is a cultural mecca, hosting the Oregon Shakespeare Festival as well as Southern Oregon University and its 5000 students. Ashland is a small town of just under 22,000 in very southern Oregon, about 15 miles north of the California border. The Oregon Shakespeare Festival is one of the largest and most successful festivals in the world, attracting as many as 400,000 visitors over its 9 month duration. Following up on that theme many of the shops in town have an Elizabethan theme. There are many interesting shops and bed & breakfasts which cater to the Shakespeare Festival and other cultural events. There is at least one very successful active adult community in the area (see link at right). Homes are on the expensive side, Zillow reports the median home value to be about $459,400 in early 2019. The Oregon Shakespeare Festival and its 400,000 visitors is the biggest thing in Ashland. The University of Southern Oregon. There are many other festivals and theatres. 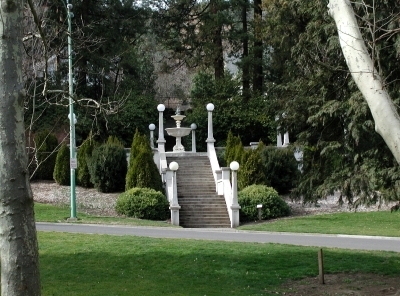 Lithia Park is a 100 acre park that was designed by John McClaren, designer of San Francisco's Golden Gate Park. Ashland's location in the Rogue Valley is another plus. CNN/Money rated Ashland #16 on its list of the Best 25 Places to Retire. Ashland is a very walkable town. It is a very long drive to a major city. Fortunately, there is a lot going on in Ashland. 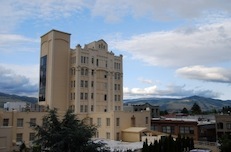 Ashland is located in the foothills of the Siskiyou and Cascade Mountains. It is 15 miles north of the California border and more than 250 miles from Portland. The average July high is 87 degrees and the average January low is 29. November is the wettest month with just under 3" of rain. Ashland is an unusually great city for culture. In addition to the Oregon Shakespeare Festival and its 780 performances there is the Independent Films Festival, the New Plays Festival, and the Oregon Stageworks theatre company. The Ashland City Band is the oldest continually running city band in the country. The crime rate is quite low. Rogue Valley Transportation District provides bus transportation. Bear Creek Greenway is a bike/walking trail that runs for 19 miles through neighboring towns. There is bus transportation to the Amtrak station in Klamath Falls.